Free Shipping. 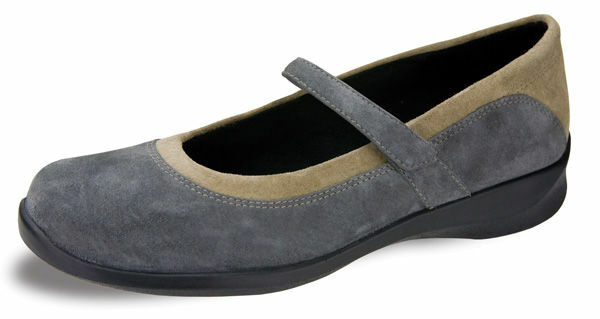 The Aetrex Essence E367 Julia Comfort Mary Jane Footwear is designed to meet the demands of both fashion and function. This black Mary Jane is made of luxuriously soft full grain leather and incorporates linings made with moisture transferring polyester fabric for maximum comfort and breathability. The E363 also features 1/4" removable depth in two layers - a patented Aetrex Performance Insole and Aetrex's innovative PRST for customization and fitting flexibility. Free Shipping. The Aetrex Essence E367 Julia Comfort Mary Jane Footwear is designed to meet the demands of both fashion and function. This taupe Mary Jane is made of luxuriously soft full grain leather and incorporates linings made with moisture transferring polyester fabric for maximum comfort and breathability. The E367 also features 1/4" removable depth in two layers - a patented Aetrex Performance Insole and Aetrex's innovative PRST for customization and fitting flexibility. Mozaic: pressure relief insole for customized comfort. Removable inserts: Two removable layers for fitting flexibility. Narrow, Medium (B/C), Wide (D/E) and Extra Wide (2E/3E) widths available. Available Widths per size: N(2A/A), M(B/C), W(D/E), XW(2E/3E).